The former Surrey Hotel is located on the corner of Castlereagh Street and King Street. 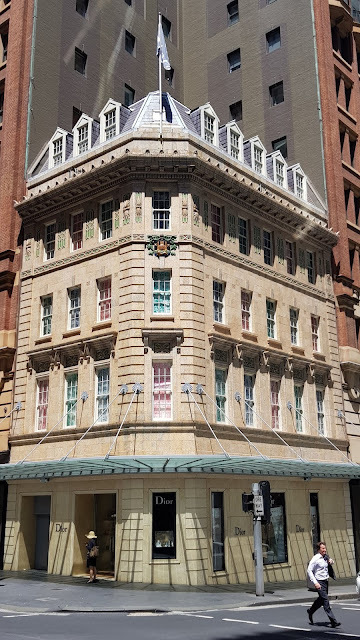 This heritage listed building was originally built in 1860 but was drastically redesigned in 1928 to an Inter-War Free Classical Style designed by Prevost, Synnot & Ruwald. It has also been known as the Bijou Hotel and Colonnade Hotel. It was later adapted for retail premises and in 1987 became the Louis Vuitton Building. A fourth floor was added within the mansard roof in 1990 and in 2011 became home to Christian Dior. The recently installed glass awning provides some great shadows on the ground floor facade.